Looking for a cheap stay in Siem Reap? Or maybe some good Siem Riep hotels? Siem Reap has accommodations to satisfy anyone's taste; from hostels to stunning resorts! East of the river near National Route 6. It's also known as Airport Road. On the sidestreets west of Sivatha Road. 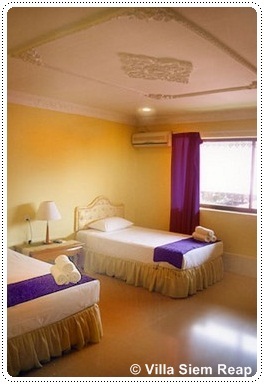 Cheap rooms in Siem Reap are basic, and there are few cheap places where you get value for your money. If you settle for mid-ranged accommodation options, most of the time you get what you pay for! The word "guesthouse" has a new meaning: many of the guesthouses I stayed at looked more like a hotel. Most hotels and guesthouses in Siem Reap offer free transfer from the airport. This place is popular among travelers and a good budget option! Double room with fan, attached bathroom with hot water. 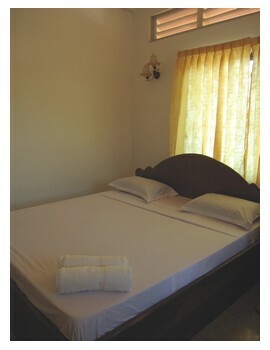 A room is clean, neat and the staff is friendly. They are more than willing to arrange your trip to the Angkor area. At night, drop by their bar and check out the laid-back atmosphere, or just sample their delicious pizzas. European Guesthouse has also a pool table and here you can exchange books. If you're going to Angkor without a guide and want to save money, hire a bicycle here! Price per night: $ 8-39 (December to February prices. $ 8 for a dorm room, $ $ 30 for double room). Swimming pool, Yoga and Pilates, book library, games, TV, pool table, lockers, free internet, luggage storage, bike rental for day trips to, say, Angkor and excellent service. This hostel is run by experienced backpackers (Australian, British and Cambodian citizens) and it was recently voted as the Best Hostel 2008. It was probably the cleanest hostel I've ever stayed at during my backpacking trip - it really lives up to its reputation! At nights, we would just hang out in their lounge watching some movies, or joking and laughing with other travelers. And they serve these frickin' delicious pancakes for breakfast. Breakfast is free if you have a private room. Otherwise, it's just $ 1 for breakfast for dorm-stayers. Not a budget option, but if you want to allow yourself the luxury, this is the place to go! Back in 2007, I got a VERY clean double room with attached bathroom - I almost didn't want to leave the room! Here you'll get your hot showers, air-con, TV, room service and a service minded staff. Before entering the building, you'll walk through a beautiful garden where you can have your breakfast, lunch and dinner :-) They serve Khmer and Western dishes - their morning buffet is not bad at all! I chose this place because 7 % of their income go to local charities. 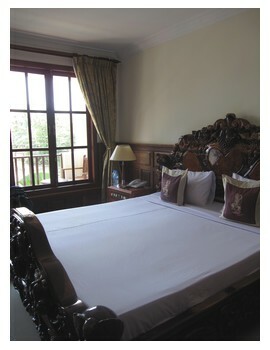 When we visited Siem Reap again in April 2010, we spent a couple of nights at Villa Siem Reap. They had only one "cheap" room left, a twin bed room. I heard from the staff that it was always full, and that a booking in advance was highly recommended. Only a 5-minutes walk to Pub street, the restaurants and markets. Address: 153 Taphul Road, Siem Reap. $35 (standard single room), $45 for a standard double room. I spent one night at Auberge Hotel. My over-all impression was very good! 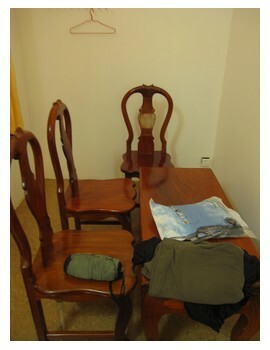 I was met by a clean and spacious double room, with all the amenities included in the price. The staff was very welcoming and so sweet. I got to know one of the waitresses at their restaurant, who told me about her life. Not much people who ate there, but most travelers prefer to eat in downtown Siem Reap. It's too bad that Villa Siem Reap across the street 'steels' the guests. Frankly, I would never have discovered Auberge Mont Royal if it wasn't fully booked at Villa Siem Reap. I was at Villa Siem Reap first, but they had no rooms left. This hotel is run by a French NGO and is teaching hospitality trade to underprivileged young Cambodians. You'll get charming and spotless rooms, that's for sure! The young employees are eager to please you and will guarantee a comfortable stay in Siem Reap, and this will leave a smile on your face! Address: 155 Taphul Road, Siem Reap. We got a clean, nice room with soft bed, balcony, private bathroom, hot water, TV and fridge - this place covers all your needs! It's tucked away in Wat Bo area, 5 minutes away from the Pub Street noise. They even have a pool in the back yard - great place to chill and avoid the Cambodian heat! The downsides: its sterile atmosphere - have you had the feeling that you were all alone in one place? - Well, that's the feeling we got! I think it's because of the dark and hard interior, and sometimes it seemed like there was no people in the building. Another thing was their "restaurant". They say they have a restaurant, but every time we ordered food, we had to wait for a long time, and it arrived by a Tuk-Tuk, meaning they're not making the food themselves. But that can be easily solved by walking 5 minutes to downtown and eat there! Plus + sides: spacious room, clean enough, private bathroom with hot water, a supermarket, ATM and "restaurant" downstairs, free internet and wi-fi and really friendly staff. We checked out the room before we checked in, and it seemed alright. No bugs on the bed. But during the night (and maybe because of the body heat), tiny beetle-like bugs came out of the mattress. When we killed one, several ones came, and they just stayed there!!! I'm not talking about 5 bugs, but 50-70 small bastards. We didn't know what to do. It was past midnight, so we couldn't wake up the staff to complain. In the end, we decided to sleep on the furniture. I slept on the table, and my boyfriend slept on three chairs. In the morning, one of the staff locked himself in while we were still laying on the furniture. My boyfriend told me that he had just locked himself in even though he was screaming "Sleeping! Sleeping!" But the boy vanished out the door again when he saw us laying on their furniture, half naked..! We checked out the next morning! On Nov 26, 2012 I received a post from the general manager of Apsara Guesthouse. "My name is Lao Raksa, the owner and General Manager of New Apsara Guest House. I am very sorry to hear about your experience while staying with us. Please know that we take bugs and privacy very seriously. - Daily inspection including mattresses, bed frames, pillows, furnishings, curtains, walls, etc. - Ongoing prevention and treatment including the use of mattress and pillow encasements when necessary. - Detailed reporting and record keeping. I would also like to apologize for the actions of one of our staff members during your stay. They have been instructed never to enter an occupied room unless the guest has authorized them to do so. Our goal is to provide our guests with great customer service and an enjoyable visit. In light of your experience, please accept my offer for a full refund; along with a complementary stay in one of our deluxe rooms the next time you are visiting Siem Reap. How is the nightlife in Siem Reap?